I will have to miss the market again this week. I am getting better so I will definitely be there next week on 18 October (unless it's crazy windy and raining). 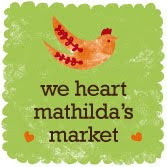 I am also trying to get ready for Mathilda's Market and will share some stuff with you soon. Feel better soon and enjoy any crafting time that you can. Might pop down and see you at Bondi. We're also better, but not enjoying this weather! Is more like Swedish October than Sydney October..